Most of the world's poorest people depend on growing crops and raising livestock to provide the food they need to eat or sell. Lundazi district that includes the valley is traditionally and predominantly an agriculture focused region with almost all its inhabitants earning their living from subsistence agriculture. Agriculture however has seen very little development such that to this day, food insecurity in the Lundazi District is an order of the day for almost every household; The consequence has been that rural dwellers of the Lundazi valley have engaged in agricultural practices that offer little dividends in terms of household food insecurity. 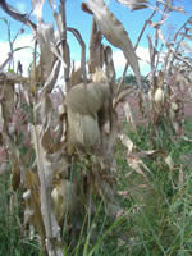 Agricultural practices have been characterized by a very destructive dependence on maize and sorghum, excessive use of small pieces of land along the river banks year after year which are being washed away by floods every year, use of recycled local seed that not only takes long to mature but is also low in yield and difficulties to access agricultural inputs due to low income levels. Added to this problem was the sudden withdrawal of government taking lead in providing agricultural inputs. This withdrawal further entrenched the food insecurity problem for communities in the valley that for long time also like the people in the plateau became used to the arrangement government provided almost free agricultural inputs to them. In an environment that is already incapacitated by household food insecurity, the advert of the HIV/AIDS pandemic standing at the district rate of 13% has further exacerbated the food security situation of the people of Lundazi District. The number of orphans has spiraled while the able-bodied young men and women have been rendered economically unproductive by HIV/AIDS, hence the need to mitigate this situation through improved food insecurity. Small-scale farmers are in a very vulnerable position. One drought or bad harvest can leave them with nothing to fall back on and no seeds for the next year. As populations grow and more crops are needed, land is over-used and after many years can suffer long-term damage. 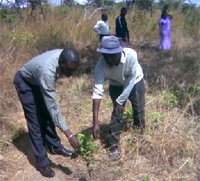 Train community members in tree planting and raising tree nurseries for agro forestry and forestry development. 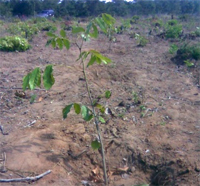 Tree-planting prevents soil erosion and help preserve the land in the long term. Some trees also fix nitrogen in the soil, which helps increase its fertility, and others have leaves which can be used for fertilizer, medicine or animal food. 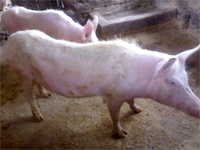 RFDP is promoting the use of inorganic fertilizer for farming. Promote food security through training farmers in sustainable agriculture techniques. Composting and using perm culture. These techniques bring higher yields, without over-using farmland. RFDP is very committed to improving food security in Lundazi District.